St. Nicholas is the Saint better known as "Santa Claus" (Sinterklaas in the Dutch whence "Santa Claus" comes). His image in America has been mixed up with a lot of traits and imagery from sources as disparate as the poetry of Clement Moore, pagan Norse mythology, and American advertising. In real life, though, St. Nicholas was a beloved and wonderful Bishop of Myra (in modern-day Turkey). He was born in Asia Minor in A.D. 260 and orphaned at an early age. As a young man, he made a pilgrimage to Palestine and Egypt, becoming a Bishop upon his return. He was imprisoned during the persecutions of Diocletian, but was released after Constantine came to rule. According to legend, he was present at the Council of Nicaea and became so incensed at Arius -- the heretical Bishop whose denial of the two natures of Christ spread through the Church -- that he slapped him across the face. He intervened twice in cases in which innocent men were accused of crimes they did not commit, once appearing to Constantine and the local prefect in a dream, encouraging them to do the right thing in their regard. And it was so that one, his neighbour, had then three daughters, virgins, and he was a nobleman: but for the poverty of them together, they were constrained, and in very purpose to abandon them to the sin of lechery, so that by the gain and winning of their infamy they might be sustained. And when the holy man Nicholas knew hereof he had great horror of this villainy, and threw by night secretly into the house of the man a mass of gold wrapped in a cloth. And when the man arose in the morning, he found this mass of gold, and rendered to God therefor great thankings, and therewith he married his oldest daughter. And a little while after this holy servant of God another mass of gold, which the man found, and thanked God, and purposed to wake, for to know him that so had aided him in his poverty. And after a few days Nicholas doubled the mass of gold, and cast it into the house of this man. He awoke by the sound of the gold, and followed Nicholas, which fled from him, and he said to him: Sir, flee not away so but that I may see and know thee. Then he ran after him more hastily, and knew that it was Nicholas; and anon he kneeled down, and would have kissed his feet, but the holy man would not, but required him not to tell nor discover this thing as long as he lived. The gold that St. Nicholas gave he put in the girls' stockings, giving birth to the Christmas tradition of hanging stockings from the hearth. It is read in a chronicle that, the blessed Nicholas was at the Council of Nice; and on a day, as a ship with mariners were in perishing on the sea, they prayed and required devoutly Nicholas, servant of God, saying: If those things that we have heard of thee said be true, prove them now. And anon a man appeared in his likeness, and said: Lo! see ye me not? ye called me, and then he began to help them in their exploit of the sea, and anon the tempest ceased. And when they were come to his church, they knew him without any man to show him to them, and yet they had never seen him. And then they thanked God and him of their deliverance. And he bade them to attribute it to the mercy of God, and to their belief, and nothing to his merits. Another Jew saw the virtuous miracles of St. Nicholas, and did do make an image of the saint, and set it in his house, and commanded him that he should keep well his house when he went out, and that he should keep well all his goods, saying to him: Nicholas, lo! here be all my goods, I charge thee to keep them, and if thou keep them not well, I shall avenge me on thee in beating and tormenting thee. And on a time, when the Jew was out, thieves came and robbed all his goods, and left, unborne away, only the image. And when the Jew came home he found him robbed of all his goods. He areasoned the image saying these words: Sir Nicholas, I had set you in my house for to keep my goods from thieves, wherefore have ye not kept them? Ye shall receive sorrow and torments, and shall have pain for the thieves. I shall avenge my loss, and subdue my madness in beating thee. And then took the Jew the image, and beat it, and tormented it cruelly. Then happed a great marvel, for when the thieves departed the goods, the holy saint, like as he had been in his array, appeared to the thieves, and said to them: Wherefore have I been beaten so cruelly for you and have so many torments? See how my body is hewed and broken; see how that the red blood runneth down by my body; go ye fast and restore it again, or else the ire of God Almighty shall make you as to be one out of his wit, and that all men shall know your felony, and that each of you shall be hanged. And they said: Who art thou that sayest to us such things? And he said to them: I am Nicholas the servant of Jesu Christ, whom the Jew hath so cruelly beaten for his goods that ye bare away. Then they were afeard, and came to the Jew, and heard what he had done to the image, and they told him the miracle, and delivered to him again all his goods. And thus came the thieves to the way of truth, and the Jew to the way of Jesu Christ. Another famous story, this one not contained in the Golden Legend, tells how three children were killed by an innkeeper and put into a tub of brine. 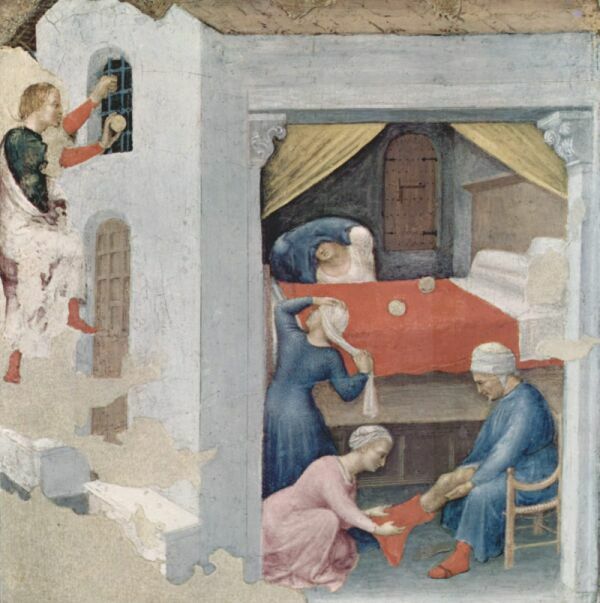 St. Nicholas, by the power of God, brought them back to life. When the great Saint died, he was buried in Myra, but the town was later taken by the Saracens in A.D. 1034. The Italians rallied to gather and preserve his relics from desecration, and in 1097, sailors brought them to Bari, Italy. A lovely church -- the Church of San Niccolo -- was built to house them, and tere they can be found today. A curative Oil of Saints -- "Manna di San Niccolo" -- is said to exude from them to this day. St. Nicholas is the patron of children, sailors, and bakers, and is represented in art as a bearded, older man -- usually mitred -- holding 3 gold coins or a bag of coins, or three orbs. He is also often shown with children, and/or a ship. Today is, for many Catholics, the day for gift-giving (some do this on Christmas, some do this on the Feast of the Epiphany in memory of the gifts the 3 Kings gave to Baby Jesus, and some spread the gift-giving out on all these days). In some places, especially in the Eastern Catholic churches, "St. Nicholas," dressed as a Bishop, will show up and hand out presents to the little ones, and children put their shoes in front of the fireplace to be filled with candy and presents by morning. Because coins are one of the many symbols of St. Nicholas, chocolate coins are a perfect thing to put in the childrens' shoes. One can use Christmas stockings instead of shoes, or one can buy adult-sized wooden shoes, paint and decorate them, and bring them out for use just on St. Nicholas's Day. 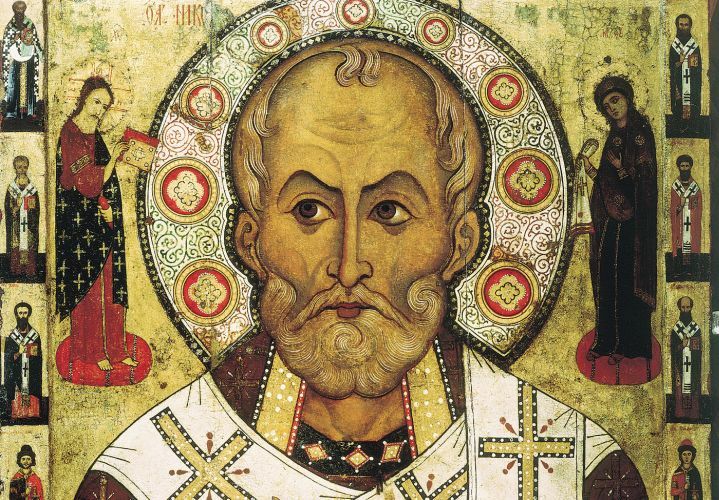 In any case, an icon -- even a nice Holy Card -- of St. Nicholas should be visible today if at all possible. Surround it with greenery and candles, and tell your children the story of the Saint Nicholas behind the "Santa Claus." In a large bowl, cream the butter with the sugar until fluffy. Stir in the eggs one at a time, blending thoroughly after each addition. Stir in the lemon rind. Sift the spices and salt with the flour and baking powder, and stir gradually into the butter mixture. Wrap in waxed paper or plastic wrap and chill for several hours or overnight. On a floured surface, roll out the dough to about 1/8 inch, or for larger figures to about 1/4 inch. Cut into shapes (Bishop, Bishop's staff, Bishop's mitre, ship, coins, etc.) and bake at 350 degrees until lightly browned (don't overbake). When cool, mix together icing ingredients and paint cookies as desired.